NESA DVD-1005 - 3/4 or 1 DIN Dash or Boot Mount DVD MP3 VCD CD Front USB Car Player. 3/4 or 1 Din Sized Multimedia Player. Plays all common formats (DVD-RW / VCD / CD-RW / MP3 / MPEG4). Anti Shock mechanism suitable for mounting in all angles from 0 to 90 degree. Comes equipped with 1 x AV output (Audio 2V / Video 1V), remote out (+ 12V switch wire) and delivered with Front USB socket. 3/4 or 1 Din Size Multi media Player. Plug in a device via the USB connection. Horizontal or Vertical mount capability. 146 x 179 x 38mm. Welcome to Car Audio Warehouse. 1 trusted online reseller for Car Audio, Car Security and Car Accessories. The name says it all. Its your one stop shop for all things In-Car. 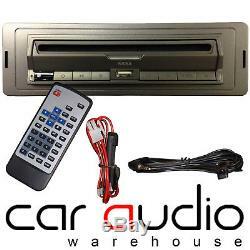 Established since 1995, we have been proudly providing car audio equipment online worldwide. The Car Audio Warehouse showroom based in West Midlands UK has over 5000 products in stock ranging from the latest Car Stereos to the latest All in One Navigations systems, you can be certain to find what you want, We are authorised dealers for Alpine, Clarion, Pioneer, Sony, Kenwood, JVC, and a host of many more high quality brands of Car Audio products from around the world and pride ourselves on our prices, product range and customer service. For car audio enthusiasts, Car Audio Warehouse is the place to be. The item "NESA DVD-100 3/4 or 1 DIN Dash/Boot Mount CD DVD MP3 VCD Front USB Car Player" is in sale since Wednesday, February 20, 2013. This item is in the category "Vehicle Parts & Accessories\In-Car Technology, GPS & Security\In-Car Entertainment\Car DVD Players". The seller is "caraudiowarehouse2012" and is located in England. This item can be shipped to all countries in Europe.